Share the post "Album review: MOTORHEAD – Bad Magic"
When I reviewed the last Motorhead album ‘Aftershock’ a couple of years back I did think that it was going to be the band’s swansong due to Lemmy’s ongoing health issues. Lemmy though has stuck two fingers up at his illness and has proved many wrong by returning both to the stage and studio. Status Quo once said ‘Rock ‘Til You Drop’, Lemmy’s philosophy in one. I did approach this album with some trepidation however after watching a live stream of the band playing at Glastonbury during the summer. The performance that day showed that Lemmy was still suffering a bit and vocally he struggled, especially towards the end of the set. Any doubts I had though were blown away on the opening track ‘Victory Or Die’, a typically feisty Motorhead number with Lemmy barking out the vocals. This then leads into ‘Thunder & Lightening’ which finds the guys in full flight with a huge riff from the Welsh wizard, Phil Campbell, a classic Motorhead track. These two tracks set the theme of the album well, listening to it you get the feeling that they wanted to prove a point and show that they are still firing on all cylinders. One song that enforces this message is the blistering ‘Shoot Out All Your Lights’. Mikkey Dee is on fire during this song and provides a massive driving rhythm whilst Campbell and Lemmy beat their instruments into submission, live this song will be an absolute monster. Brian May makes a guest appearance on ‘The Devil’ which has a sleazy blues riff, about as far from ‘Radio Gaga’ as you can get! 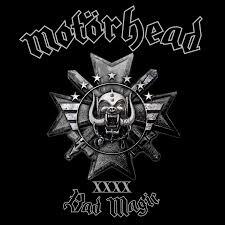 The lead track from the album ‘Electricity’ follows and it is a typical Motorhead signature tune, it just couldn’t be by anyone else. ‘When The Sky Comes Looking For You’ then brightens things up with an uptempo, upbeat melody, the party track of the album almost. An excellent cover of the Stones ‘Sympathy For The Devil’ then rounds things off in fine style. This entry was posted in ALBUM REVIEWS, ALBUM REVIEWS (Mobile), All Posts and tagged Aftershock, album, Bad Magic, blues, Brian May, CD, Glastonbury, Lemmy, metal, Mikkey Dee, Motorhead, Phil Campbell, review, rock. Bookmark the permalink.